Back in May Samsung launched Galaxy J6 and Galaxy J8 in India Samsung has sold more than 2 Million units of Galaxy J6 and Galaxy J8 in India. 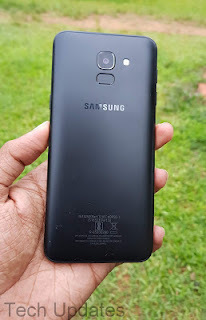 Now Samsung Galaxy J6 gets a Price drop in India 3GB RAM model cost Rs 12,990 whereas 4GB Now Cost Rs 14,990. Samsung Galaxy J6 has a Polycarbonate back and metal on the side. It has a 5.6-inch HD+ Infinity display powered by Exynos 7870 octa-core processor coupled with 3GB RAM, 32GB Storage and 4GB RAM, 64GB Storage which is further expandable with MicroSD.On Camera, it has 13-megapixel and 8-megapixel rear and front cameras (with an LED flash for both), dual SIM slots and LTE support. Dual SIM device run Android 8.0 Oreo with the Samsung Experience 9.0 UX out of the box. Samsung Galaxy J6 is packed with a 3000mAh battery which comes with 5V 1A Charger takes almost 3 Hours to charge fully, Forget quick Charge Samsung should have at least provided 5V 2A Charger in the box.